The shocking terror attacks in Paris were met with a largely calm and even defiant response from global financial markets on Monday. Stocks in Paris were resilient following the tragic loss of at least 129 lives while Wall Street posted big gains. The Dow closed up 238 points, its biggest gain in more than three weeks. The calm response reflects the sense that while the Paris terror attacks were horrific, they are unlikely to derail the global or U.S. economies. "Because we don't see these terrorist actions causing substantially more weakness to the global economy, we believe any share price decline will be short lived," wrote Sam Stovall, U.S. equity strategist at S&P Capital IQ. The fact the terror attacks took place late after U.S. markets had already closed Friday may have allowed for a less emotional response by investors. "People have had a chance to come to terms with it," said Brad McMillan, chief investment officer at Commonwealth Financial Network. McMillan added that investors have long understood that "maniacs" are trying to kill innocent people and they will occasionally succeed. "Every time we get on a plane or look at the New York skyline we're reminded of the fact that terrorist attacks are out there. This is one more horrible reminder," he said. Even crude oil, usually extremely sensitive to geopolitical threats that could disrupt supply, initially failed to rally. Oil nearly broke through $40 a barrel before before rebounding and closing the day at nearly $42. Gold, viewed as a place to put your money during scary times, rose just slightly. CNNMoney's Fear & Greed Index was firmly in "neutral" mode and even improved slightly from Friday's close. "The 'terrorism trade' ... lasted less than a session," Bespoke Investment Group wrote in a note to clients. Some parts of the stock market did take a hit amid concerns about the impact on tourism. Shares of Priceline (PCLN), Carnival (CCL) and Expedia (EXPE) all declined more than 1.5% apiece on Monday. Airlines were also weak, with Delta Air Lines (DAL) and American Airlines (AAL) retreating. The Paris terror attacks come at a time of increased jitters for investors. The Dow tumbled 665 points last week, its biggest weekly decline since August. The selloff has been fueled by plunging oil prices and nervousness created by the increased chances the Federal Reserve will raise rates next month. A rate hike should boost the already-strong U.S. dollar, making American goods sold overseas even more expensive. But investors seem to recognize that previous terror attacks the size of the ones in Paris have caused just fleeting selloffs on Wall Street. In other words, it doesn't make financial sense to panic. For example, after the 2005 London subway bombings that killed 52 people the S&P 500 fell nearly 1% the day after, Stovall pointed out. But the selloff lasted just two days and the index recovered lost ground after a week. Likewise, the S&P 500 declined 1.5% following the Madrid bombing in 2004 that killed 191 people, but it reached a bottom two weeks later and rebounded. Stovall said the S&P 500 lost 2.3% of its value after the Boston Marathon bombing of 2013 that killed three people and injured at least 264. The market bottomed in four days and recovered all lost ground in just over two weeks. "History says, but does not guarantee, that market weakness following such horrible events is typically short lived," Stovall said. 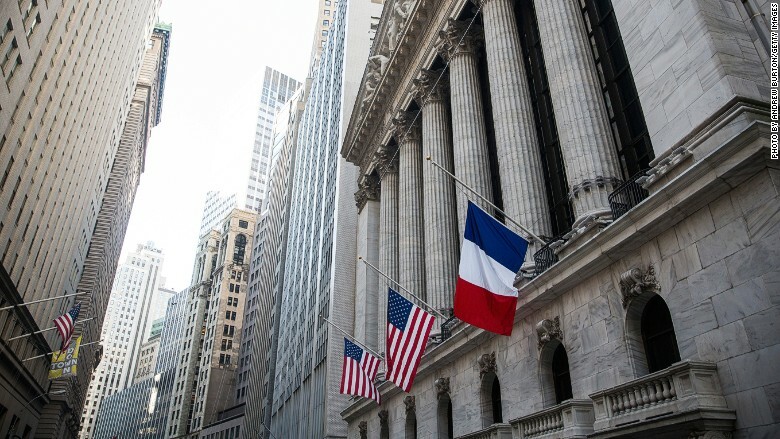 Some prominent Wall Street strategists took a defiant tone following the Paris attacks. David Kelly, chief global strategist at JPMorgan Funds, highlighted the "steadfast refusal" by citizens to allow terrorists to dictate how they will live their lives. "Paris will not stop being Paris because of the actions of a few cruel psychopaths," he wrote. Peter Boockvar, chief market analyst at The Lindsey Group, wrote that terrorists "will never be able to stop freedom, human and economic progress."